The Palm is a small, companion phone. What this means is that it requires a Verizon smartphone in order to work. The device comes with a 3.3-inch IPS LCD display with a 720x1280 resolution. The phone is powered by a 1.4GHz Octa-Core Qualcomm Snapdragon 435 processor with 3GB of RAM, a built-in storage of 32GB, and a microSD card slot for up to 256GB memory expansion. The device has a 12-megapixel rear-facing camera with 1080p video recorder and a secondary 8-megapixel front-facing camera. It includes a 800mAh battery. The phone runs on Android 8.1 Oreo upon release. 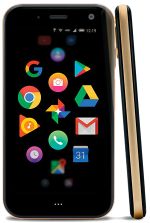 Palm has released a new mini-phone that is designed to give you a break from your primary phone. It uses Verizon's NumberShare technology to let you receive calls and texts, and costs a steep $350 off-contract.